The native fauna and flora of the British Isles has been augmented by introductions over many centuries. Some trees like the Sycamore and the Sweet Chestnut arrived many centuries ago and have become integrated into our landscapes. Other aliens are more recent arrivals with a few being perceived as invasive species. 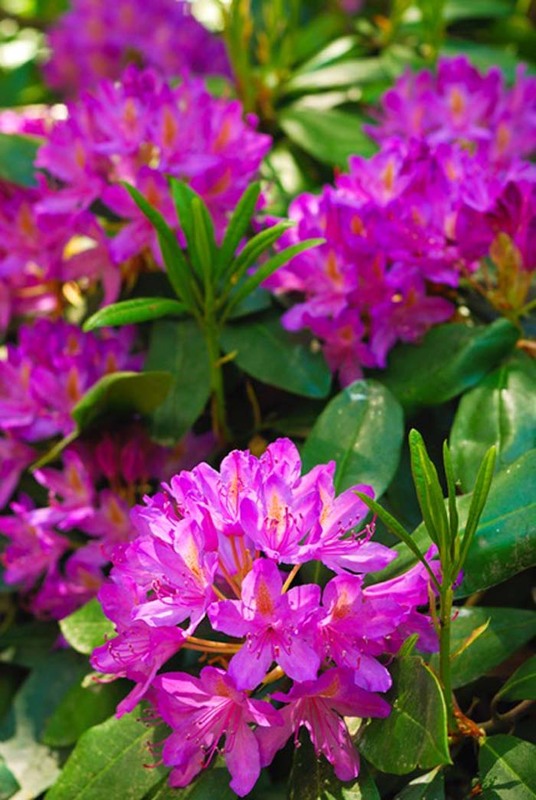 One of these is the purple flowered Rhododendron ponticum which produces viable seeds and spreads some distance from its introduced sites. These within the Park were planted in the 19th century to provide cover for game birds which were shot. They may be of botanical interest. However, in some localities there is concern about this species as it produces toxins which inhibit regrowth of native species. It also acts as a host for the pathogenic fungus Phytophora ramorum which can infect certain tree species. Floating Pennywort (Hydrocotyle ranunculoides) is a native of North America. It was first brought to Britain in the 1980's by the aquatic nursery trade to sell as a plant for tropical aquaria and garden ponds. It was banned from sale after April 2014, as it causes a range of problems including changing the availability of oxygen in the water, threatening fish and invertebrates, choking drainage systems and crowding our native water plants. 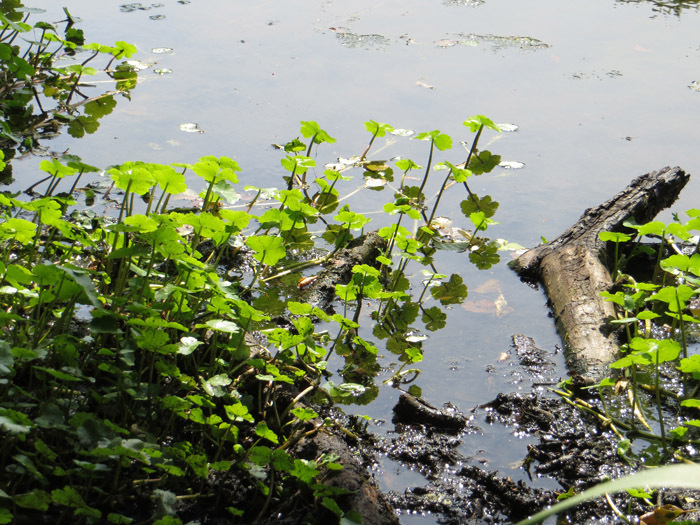 It is causing problems in a number of water bodies across Epping Forest, and in Wanstead Park there is an infestation in Perch Pond. 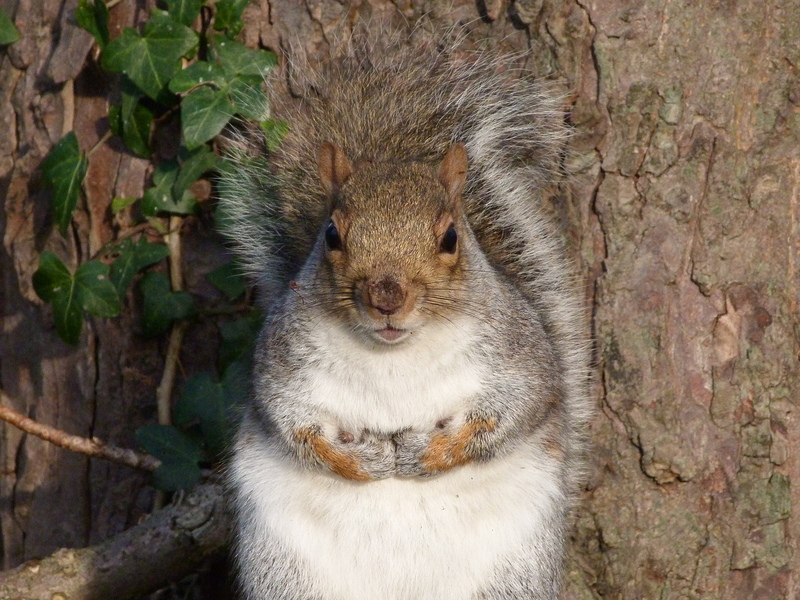 The Grey Squirrel is a common sight in the Park and this adaptable species can become quite tame. Originating from North America, Grey Squirrels were introduced during the late 19th century. The first recorded introduction into the wild was in 1876 when a pair was released in a park in Cheshire as interesting exotics. Escaping from captivity, the numbers increased and have spread far and wide. Adults are heavier than the native Red Squirrel and they out compete the native species as females produces two litters of kits each year; the first in February or March and the second in midsummer. They also carry the squirrel pox virus which is fatal to Red Squirrels. Although primarily a vegetarian, Grey Squirrels will eat eggs and nestlings. The last reported sighting of a Red Squirrel in Wanstead Park was in 1947. From time to time American mink (Neovison vison) are seen in Wanstead Park. These are descended from animals imported for fur-farming from the 1920s. Over the years there were numerous escapes and deliberate releases, and this species has now become established over much of the country. 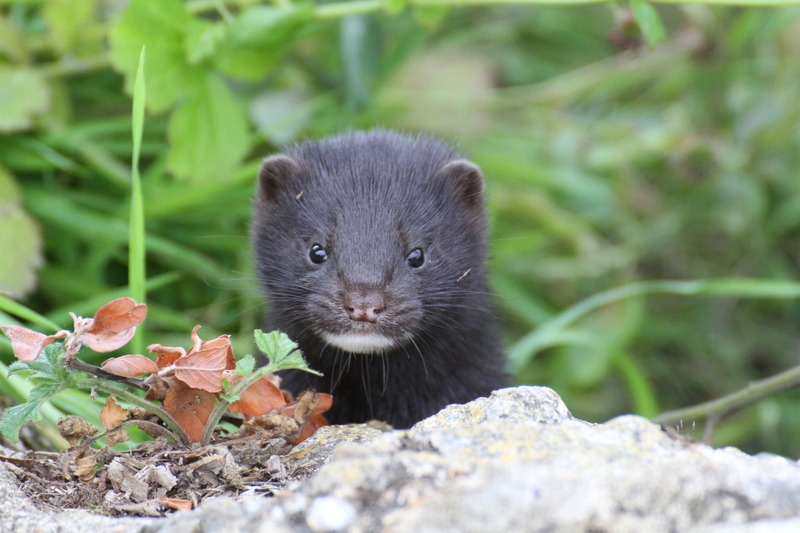 Mink are excellent swimmers and difficult to catch, being intelligent, highly mobile and unpredictable in their movements. They prey on native animals and birds such as water voles, moorhens, kingfishers and endangered white-clawed crayfish. 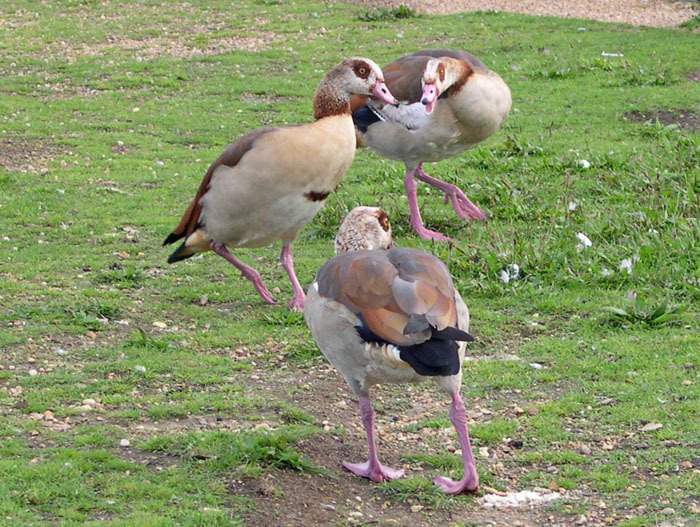 A more benign introduced species is the Egyptian Goose (Alopochen aegyptiacus) which is actually a relative of the Shelduck. It was first noted as a breeding species in the London area in 1990. This species has been seen in the Park since 2011. 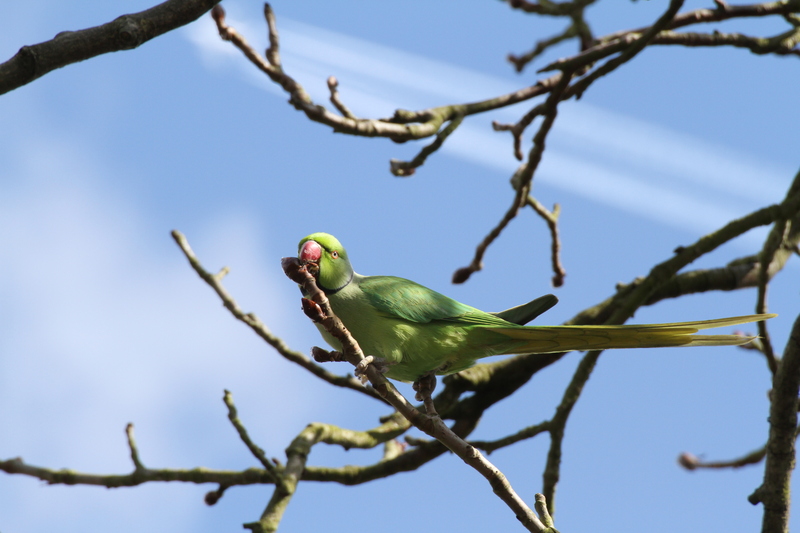 The Ring-necked Parakeet has a large range, extending across Africa, the eastern Mediterranean to the Indian subcontinent. Caged birds have escaped and survived in the wild over many decades, and a breeding colony was first established in West London. Individual birds were first noted in the Wanstead area in 1985 and their numbers have increased since then. The parent birds take up residence in a hollow tree creating a nest of feathers and debris. In January the female lays a clutch of 3 -6 eggs which she incubates for about four weeks. Both parents feed the young which fledge at eight weeks to fly in noisy flocks, feeding on leaves fruit, seeds and occasionally meat. It is not known if their presence will have an impact on the breeding behaviour of our native species. Signal Crayfish and Red-eared Terrapins are two alien species present in the local lakes and both consume many smaller aquatic creatures. 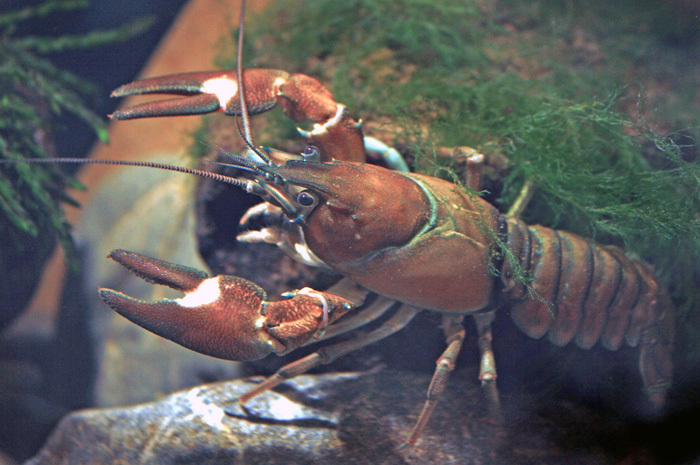 The Signal Crayfish (Pacifastacus leniusculus) is lobster-like in appearance and reaches a maximum size of 16-18cm. It is driving native crayfish towards extinction through the spread of crayfish plague and competition for resources. 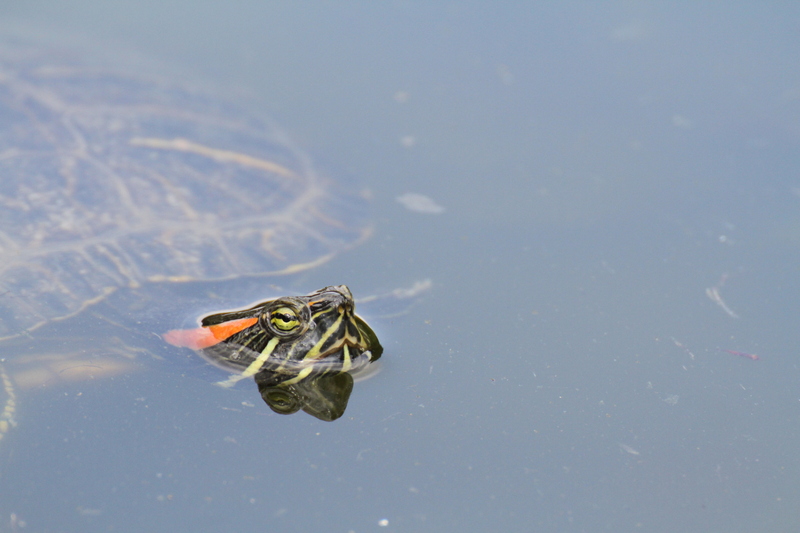 The Red-eared Terrapin (Trachemys scripta) is native to South and Central America. It consumes any aquatic animal life it can catch, as well as plants. It threatens and outcompetes native animals in some cases and also reduces numbers of invertebrates, possibly taking fish and young waterfowl too.